In a wide-open race, candidates are scrambling to get CEO endorsements. Our exclusive Fortune survey goes behind the scenes from Wall Street to Silicon Valley to find surprising alliances and discover how they were forged. (Fortune Magazine) -- One of Hillary Clinton's most important courtships began early last year, around a formal dinner table at Georgetown's Four Seasons Hotel. Her targets were Morgan Stanley CEO John Mack and his wife, Christy. Mack was already active politically - but on behalf of Clinton's political opponents. A Bush "Ranger," he had raised at least $200,000 for the President's reelection bid and was one of the most prominent business names on GOP donor lists. At one time his name had circulated as a potential Bush Treasury Secretary. But these are strangely fluid political times, with long-held alliances shifting under the weight of an unpopular President, an unpopular war and no obvious White House heir on either side. You don't have to be an early leader to earn big-name backers. Through personal connections and home-state political relationships, business leaders also turn out for the latecomers and long shots. Supporter: James A. Haslam II CEO, Pilot Corp. The late arriver is snagging undecideds like the Knoxville convenience-store mogul. Supporter: John Tyson CEO, Tyson Foods Former governor is backed by Arkansas business, including Wal-Mart heir Jim Walton. Supporter: Darshan Dhaliwal President, Bulk Petroleum Thompson courts local big cheeses like the Milwaukee-based gas-station tycoon. Supporter: Charles Cawley Former CEO, MBNA The founder of the Delaware-based bank has supported Biden for many years. Supporter: William Greehey CEO, Valero Energy Richardson, a Clinton Energy Secretary, served on Valero's board in 2001--02. Supporter: Steve Cohen Founder, SAC Capital Many Greenwich hedge fund heavies turn out for Connecticut's senior Senator. Morgan Stanley (Charts, Fortune 500) chief administrative officer Thomas Nides, a former Clinton trade official and one of the Democratic Party's more astute strategists, understood the possibilities better than most. That's why he had invited the Macks to a fundraiser for Clinton's Senate reelection at his Washington home - and then completed the evening by taking the trio to dinner at the Four Seasons. The subject of a Clinton presidential bid never came up that night - except in Nides's whirling brain. He knew that the prospect of persuading his Republican boss to support a Clinton presidential bid was a long shot. But he also appreciated the importance of trying. Adding such a prominent GOP executive to the Clinton roster would counteract business fears that the former First Lady is a big-government, big-spending, big-taxing liberal. "It would say to the business community, 'It's safe to swim here,'" Nides recalled. The conversation that night ranged widely, but always returned to one subject: health-care reform. John Mack chairs the board of trustees at New York-Presbyterian Hospital. Christy Mack, the daughter of a doctor, helped found the Bravewell Collaborative to promote health care that treats "the whole person, not just the disease." Hillary Clinton was on familiar territory - and managed to charm the couple not only with her "intelligence and educated responses," as Christy Mack recalls, but also with her one-on-one charisma. "You have these preconceived ideas about people you see in the public eye," says Christy. "But we were extremely impressed with her ability to connect with every single person. She was an amazing listener, with tremendous warmth." The relationship could have ended there - a New York Senator engaging her local constituents. But early this year Clinton upped the ante with a phone call to the Morgan Stanley CEO, asking him to support her presidential bid. When he demurred, she asked for a meeting. Once again - this time over coffee - John and Christy Mack found themselves enticed. When Mack returned to his office, he told Nides he was ready to commit. "John, you can wait, you don't have to commit yet," Nides responded. "No," Mack replied, "early support is better support." Days later Mack picked up the phone and sealed the deal. Clinton, Nides recalls, "put the time in." Multiply that effort many times over, and you can understand why the safe to swim signs are sprouting up all over Clinton Inc. Yet she is not the only Democrat to achieve surprising success in a realm traditionally taken for granted by Republicans. 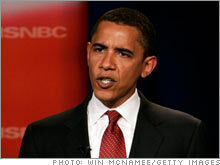 Her leading Democratic opponent, Barack Obama, has made forays into Wall Street and Hollywood to nab business support. He, too, has found admirers among top Republicans, most notably John Canning Jr., CEO of Chicago private-equity firm Madison Dearborn. For their part, top GOP candidates like Rudy Giuliani, John McCain and Mitt Romney have lined up a small army of pinstriped pitchmen. But what's different this time is that CEOs are up for grabs on both sides. A Fortune survey of where business leaders are lining up in the 2008 race, based on dozens of interviews with top executives, reveals a concerted push by Democratic candidates to secure the blessing of big business while they continue to take their swipes at corporate America on behalf of the little guy. Even at this early stage of the primary race, the business endorsements of Clinton alone rival - in size, scope and prestige the list of CEOs publicly supporting the Kerry-Edwards ticket in the 2004 general election. The more than 150 top executives who have raised money for Clinton represent such brand names as Anheuser-Busch (Charts, Fortune 500), Comcast (Charts), Est�e Lauder, Palm (Charts), Sun Microsystems (Charts, Fortune 500) and Qualcomm (Charts, Fortune 500). Venture capitalist James D. Robinson III, the former CEO of American Express and a longtime Republican, told Fortune he now supports Clinton for President, citing her "breadth of experience, especially on the international level, which is critical for going forward." A difficult war tests loyalties among business leaders, just as it does among other voters, who increasingly identify themselves as Democrats. But Iraq is only one factor behind this year's wide-open race for business support. With the scandals of the early part of the decade behind them, corporate leaders are once again emerging as opinion leaders - not only speaking out on such issues as health care, taxes and the environment, but calling for government action. 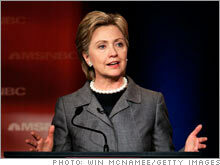 "This has been an important period for businesses of all sizes," Clinton told Fortune. "They really can't control health-care costs." And Clinton's Senate tenure has been a significant antidote to her controversial stint as a First Lady proposing health-care reform, which critics decried as an attempt to nationalize medicine. "There has been a real opportunity to know me and work with me," she says, "and to develop personal friendships." Not to be discounted is that corporate America likes to bet on winners. Coming on the heels of the Democratic takeover of Congress, the party has a real shot at winning the White House. For Republican candidates, a sour political environment is only the beginning of the battle. With several strong candidates and no clear front-runner, a business community that largely united behind George W. Bush in 2000 and 2004 is now more fractured, with most major Bush donors still sitting on the sidelines. "Even in 2000, Bush was the presumptive nominee," notes longtime GOP fundraiser and Thayer Capital chairman Fred Malek. "Signing up with Bush was a no-brainer." Business leaders can provide added heft to a candidate's fundraising efforts - the major candidates are expected to raise a record $1.4 billion in this race - but they also help a candidate's image branding. Democrat John Edwards, who offers sharp-edged populism, is a tougher sell to business. But Clinton and Obama view CEO support as a key part of their crossover appeal. A roster of business endorsements "says to voters that you'll be strong on the economy," says Clinton campaign chair Terry McAuliffe. Most of the top-tier candidates - Republican and Democrat - have made pilgrimages to the Business Roundtable's offices in Washington to pitch some 60 CEOs at a time. Longtime Republican Harry Sloan, chief of MGM Studios, told Fortune he had been approached by Obama and Clinton, as well as supporters of second-tier candidates Christopher Dodd and Joseph Biden. 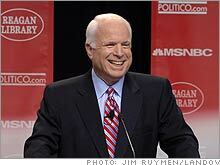 But he's sticking with McCain, whom he calls "the most principled political leader of our generation." Still, Sloan notes that McCain is a more difficult sell than in his 2000 run, when he even drew admirers from liberal-dominated Hollywood. Those days are over. "Because of the Iraq war and John's position on the war right now, the same people aren't prepared to fully support him," says Sloan. "And many haven't given money for that reason." Despite Democratic inroads into the business community, the three top declared GOP candidates have long careers that give them connections to name-brand players. Former Massachusetts Governor Romney has used his deep roots in business to enlist the likes of Miami Dolphins owner H. Wayne Huizenga and Utah Jazz owner Larry Miller, as well as Staples founder Tom Sternberg. In Silicon Valley he counts on eBay CEO Meg Whitman and Next Solutions CEO Doug Wilson, while onetime colleagues like Bain & Co. founder William Bain, his former boss, stand by their man. "It's the strength of his leadership ability, his get-it-done attitude," says Marriott CEO Bill Marriott. Giuliani's Wall Street support isn't as broad as that of fellow New Yorker Clinton, but he has culled important business support in Texas and elsewhere. Billionaire hedge fund manager T. Boone Pickens has raised nearly $1 million for the candidate. "In New York he cleaned up the city, ran Mafia convictions, then [handled] 9/11," Pickens says. Giuliani also has the support of Texas Rangers owner Tom Hicks, billionaire investor Sid Bass, and superstar activist Carl Icahn. McCain has won the backing of FedEx chief Fred Smith, Cisco CEO John Chambers, New York Stock Exchange chief John Thain, and Boston Scientific's Pete Nicholas. In contrast to the grass-roots conservative voters McCain is trying to woo in his primary battle, top executives applaud the Senator's willingness to work with Democrats on issues like immigration reform. This year's scramble for the business seal of approval can make it hard for candidates to pin down a loyal commitment. Blackstone Group CEO Stephen Schwarzman and Amgen CEO Kevin Sharer have written checks to McCain - and to Romney. Verizon CEO Ivan Seidenberg has donated to John McCain - but also to Clinton. Among Democrats, too, looks can be deceiving. Much attention was lavished on hedge funder Paul Tudor Jones's splashy May 19 fundraiser for Obama at his waterfront mansion in Greenwich, Conn. Less noticed was the $2,300 check he wrote to Giuliani just two months earlier. David Geffen invited presidential prospect Michael Bloomberg to his Beverly Hills home June 19 for an intimate dinner - but he's formally supporting Obama. "I'd say 75 percent of the donor community in Hollywood has given to multiple candidates," says Andy Spahn, longtime political advisor to top entertainment figures. "For these people $2,300 [the legal cap on donations] is not a stretch." Regardless of their personal feelings, many CEOs avoid publicly aligning themselves with a candidate, concerned about offending boards, employees and customers. "If you're a consumer products company and you get your head up too high, you're going to alienate some customers," notes Malek. "Even if you produce industrial products - there are customers who are Democratic and customers who are Republican." But FedEx CEO Smith insists that his personal support for McCain aligns with his company's interest in reducing America's dependence on foreign oil and maintaining a robust free-trade stance. "Those would be two of the issues that loom very large in this election that would be directly on point with FedEx's business interests," he told Fortune. Likewise, supporters of Democratic candidates say their companies would benefit from federal action to reform the health-care system. When I told a leading GOP fundraiser the news that John Mack had thrown his weight behind Clinton, she was stunned. "You're kidding me, right?" (Actually she expressed the sentiment more graphically.) Says GOP veteran Malek, a McCain supporter: "It concerns me that any solid-thinking top businessperson would go the Democratic route, given the party's liberal ideology." Clinton's critics say a close reading of her Senate record should give business leaders pause. The Chamber of Commerce estimated that she voted with that group's position 45.8 percent of the time; for the National Association of Manufacturers, it was 16 percent in the last Congress. Still, notes a conservative investment banker, "I don't think Hillary Clinton scares people the way she did in the '90s." And that gives her an opening with former opponents. Jeffrey Volk, global head of Citigroup's agency and trust business, was with his wife and freshman daughter at Tulane University when Hurricane Katrina struck. (Like others interviewed for this story, Volk stressed that his political views are personal and not his firm's.) The family was stranded in a hotel room, fearful - like others - as power faltered, water levels rose and chaos engulfed New Orleans. His many efforts to reach Washington officials ended in a black hole of automated voicemail. That was when this lifelong Republican called his home-state Senator's office. The Clinton staffer who took his case wasn't able to produce an airlift for stranded New Yorkers and others, as Volk requested, but he did call the family several times a day to check on them. "When I was in harm's way, her office was there to help me and my family," Volk says. When he returned to New York, Volk made it a point to meet Clinton at a small event at the home of a mutual friend in White Plains. He went there simply to thank her, but at the end of a two-hour policy discussion, Volk - who once helped Ronald Reagan craft an economic platform - had decided he wanted to support her. What converted him: "Her knowledge of issues, the tradeoffs you have to make for a pragmatic policy, her grasp of details on subjects ranging from fiscal policy to taxes and trade." But Clinton doesn't always go over with business executives - especially outside Wall Street, Silicon Valley, and Hollywood. Obama Democrats insist that Clinton remains a polarizing figure, which gives their candidate - with his "let's all get along" theme book - his own opening in the business community. Obama's inclusive style is often an easier sell to corporate leaders looking for someone with whom they can do business. Obama supporters say that while Clinton is relying on establishment Democratic players, they've tapped into a new pool of business leaders who weren't politically active before now. "That pool of people is vastly larger" than the usual suspects, says Boston Provident partner Orin Kramer, a leading Democratic figure in New Jersey. Wall Street in particular began leaning Democratic in the 2006 congressional election, making it a ripe target for Obama and Clinton. Their GOP foes are bemused by the trend. "A lot of hedge fund managers and others who are younger don't remember when you had bad tax policy and how powerful the negative effects can be on the economy," says investor James Higgins, co-founder of the conservative Monday Meeting in Manhattan. Indeed, on tax policy especially, most business leaders are out of sync with Democrats, who want to limit the Bush tax cuts, penalize companies that build plants overseas, and increase taxes on private equity and tax funds. Asked about this, Clinton's GOP business supporters say they have other priorities. Volk wants to see the federal budget balanced. Robinson wants healthcare and education policies that will improve America's competitiveness. Hillary Clinton says simply, "It's important not to have a tax discussion separate from [deciding] what are our goals." For Clinton, there is an underlying tension between the candidate who can do business with business - and the candidate who must curry support from the party's left wing to win the nomination. At a speech before grass-roots activists in Washington on June 20, she was booed by antiwar activists but applauded when she took corporate America to task. Deriding the country's "highest concentration of wealth ... since 1929," she declared,"Let's start holding corporate America responsible, make them pay their fair share again. Enough with the corporate welfare! Enough with the golden parachutes! And enough with the tax incentives for companies to ship jobs overseas. We have to make sure there is not a single benefit they would get for doing that." Five hours later she was on the phone with Fortune - and her tone was far more measured. Asked how she could balance an appeal to business with that sharp rhetoric, the Senator answered, "To me it's about getting back into balance. It's the search for that balance that's appealing to a lot of business leaders. They know I'm trying to figure out how we can have shared prosperity." As any CEO can tell you, it ain't as easy as it sounds. John Mack CEO, Morgan Stanley Winning over the longtime Republican sent a signal about Clinton's clout on Wall Street. Sheryl Sandberg VP, global online sales, Google "I was always hoping she'd run for President. She's uniquely qualified." Steve Rattner Managing principal, Quadrangle Group "I've been a longtime supporter of the Clintons. I knew I'd end up in her camp." Steven Spielberg Co-founder, DreamWorks The mogul co-hosted a fundraiser at the home of News Corp. president Peter Chernin. Haim Saban CEO, Saban Capital Group "I endorsed Hillary before Hillary decided to endorse herself. I'm on a mission." James D. Robinson III General partner, RRE Ventures The former AmEx CEO likes her "breadth of experience, especially on the international level." The former New York City mayor has built a team of fundraisers he has known since early in his career, but his support on Wall Street suffers a bit from lingering feelings that he was overzealous as a prosecutor. Carl Icahn Billionaire investor and activist "Republicans have to pick the candidate most likely to beat Hillary Clinton. Rudy is the one." T. Boone Pickens Founder, BP Capital hedge fund "Every time they rang the bell, the guy was there. He finished every fight." Paul Singer Founder, Elliott Assoc. hedge fund "I believe the mayor is the strongest and most conservative candidate in the race." Bill Simon Venture capitalist "When you're the mayor of New York, you do have a foreign policy." 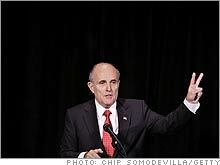 James Turley CEO, Ernst & Young Besides creating a business alliance with Giuliani in 2002, Turley is a fundraiser. Randy Levine President, New York Yankees "He did an outstanding job during and after 9/11. Overtime he's become a great leader." The Illinois Senator has a solid base of business support in Chicago but has also fared well with Hollywood media moguls and has aggressively moved into Clinton's turf among East Coast financiers. Oprah Winfrey Founder, Harpo Productions Her endorsement of Obama was the first ever forthe billionaire media powerhouse. Penny Pritzker Chairman, Classic Residence by Hyatt "I've watched him dialogue with CEOs. Heads are nodding, people are excited." David Geffen Co-founder, DreamWorks He endorsed Obama - but first took a public swipe at his old friends, the Clintons. Jeffrey Katzenberg Co-founder, DreamWorks "His sense of right and wrong, what's just and fair, is what's needed for these times." James S. Crown President, Henry Crown & Co. The investor says his family, one of Chicago's wealthiest, "is solidly behind" the candidate. Orin Kramer General partner, Boston Provident "We're tapping into people in business who haven't been involved in the process." Romney has accumulated an impressive business lineup just by courting the "low-hanging fruit," as Bill Marriott puts it, of friends and associates from private equity, Boston, and the Mormon community. Bill Marriott CEO, Marriott International Tapping his deep Rolodex in the hotel industry. "People like what he did with Massachusetts." David Neeleman Founder and former CEO, JetBlue Trying to bring Mitt into the middle ground. "I think he's moderate in a lot of ways." Bill Bain Founder, Bain & Co. �ber-consultant and longtime mentor. "Mitt understands why companies decide to invest." Meg Whitman CEO, eBay Serves as campaign chair. "Democrat or Republican, he would hire the right people." Wayne Huizenga Owner, Miami Dolphins Courted by Rudy, but likes Mitt's "conservative principles, like smaller government." Bill Harrison Former CEO, J.P. Morgan Chase Hosts Greenwich, Conn., and New York City events. "Mitt connects unbelievably well with people." As a former trial lawyer campaigning on a pro-union platform, Edwards is not the go-to guy for big business. Yet he has important allies, including many at a hedge fund where he once consulted. James Sinegal Co-founder and CEO, Costco stores The lifelong Democrat threw his support behind Edwards after hearing his plans on health care. Wesley Edens CEO, Fortress Investment Group About 100 of the secretive financier's employees have donated to Edwards's campaign. Leo Hindery Chairman, InterMed Advisors Edwards has made the former cable-TV magnate his senior economic advisor. Howard Schultz Chairman, Starbucks The coffee mogul hosted a fundraiser at his Seattle home for about 150 potential donors. Andy Rappaport Venture capitalist, August Capital "I believe that if the 2004 ticket had been reversed, John Kerry would be Vice President today." Jason Flom CEO, Capitol Music Group Flom has sought support for Edwards within the music industry by hosting fundraisers. The Senator from Arizona has gone head-to-head with the Senator from New York to win Wall Street support. A key ally is Lew Eisenberg, former chief of the Port Authority and powerful Bush fundraiser. Fred Smith Founder and CEO, FedEx "He does what he thinks is right, The most current example is the immigration issue." James B.Lee Jr. Chairman, J.P. Morgan Chase Investment Bank This captain of Wal I Street is a national co-chair of the campaign. David Pottruck CEO, Red Eagle Ventures "He's not afraid to do the hard things. He has the character and the energy and commitment." James Chambers CEO, Cisco Systems "He understands the value that technology contributes to economic prosperity." John Thain CEO, NYSE Euronext Another campaign co-chair, he's working with Lee to make inroads on Clinton's turf. Harry Sloan CEO, MGM movie studio "I made the decision to support him before there were any other candidates." Full disclosure: Writer Nina Easton's husband is a consultant to the McCain campaign.